Technical Car Experts Answers everything you need: 2005 Scion XB: Evaporator coil Replacing? How to replace Evaporator coil. The flat rate time for this job is 6 hours and the entire instrument panel has to be removed then the main cross beam/steel tube. 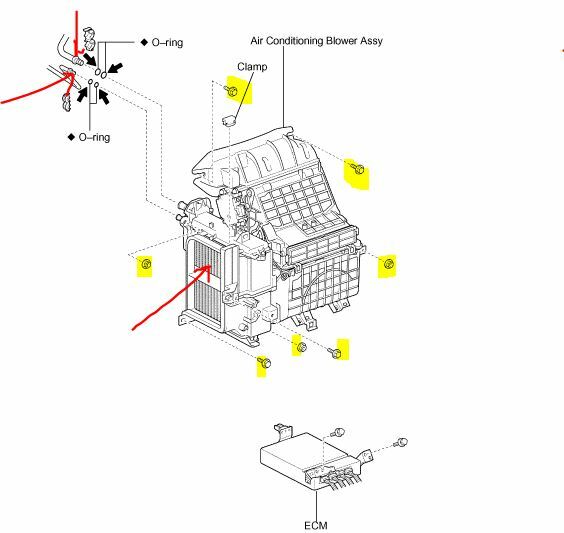 The Basic info and bolt locations Diagrams on the evaporator case assembly. Once the instrument panel/ the front panel is off. The evaporator core box/assembly has to be removed then the case splits in half to get the core out. The lines have to be disconnected from under the hood once the Freon is removed. Evaporator coil removal and ECM disconnecting. Take your time while you remove the two lines under hood.Slowly carefully disassemble the clamps without damaging the lines.